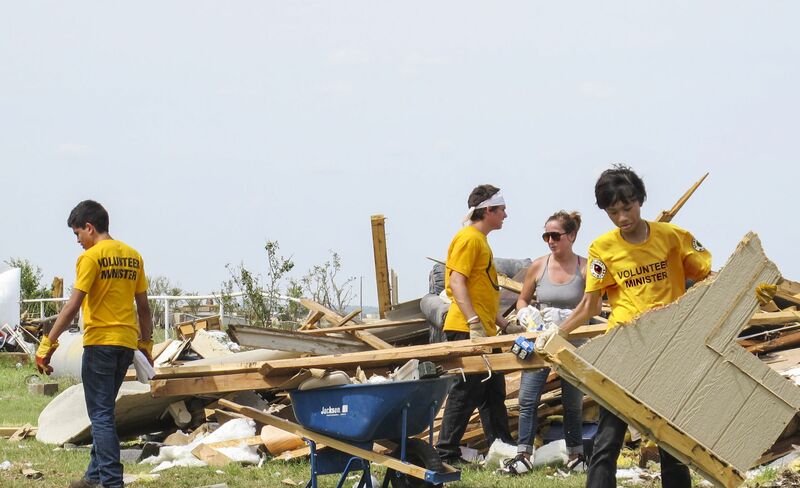 Scientology Volunteer Ministers helped with the cleanup after the May 2013 tornado devastated Shawnee, Oklahoma. Tornado season fast approaching (there were 39 U.S. tornadoes in February 2013) and Scientology Volunteer Ministers teams from across the country are poised to respond. The most erratic of natural disasters, the tornado strikes with a fury unparalleled by any other force of nature. So it was from May 19 to 31, when a series of tornados devastated Oklahoma and other Midwestern states. It began when a tornado touched down in Shawnee, Oklahoma, causing widespread damage. The following day, a twister struck 39 miles west in the city of Moore. With winds in excess of 200 miles per hour, the tornado obliterated everything in its 17-mile path, killing 23, destroying a hospital and two schools, leveling 1,100 houses, damaging another 12,000 and causing more than 2 billion dollars of damage. It further uprooted countless trees and flattened power lines leaving 200,000 without electricity. Less than a week later, a 2.6-mile-wide tornado decimated nearby El Reno, Oklahoma, with winds almost 300 miles per hour. As soon as the tornadoes struck, the Volunteer Ministers Disaster Response Unit sent out a call for volunteers. They arrived from Wichita, Salt Lake City, Dallas, the Tampa Bay area, Los Angeles and Vancouver. They assisted at the sites of greatest damage: Shawnee, Moore County and the town of El Reno, where they joined with other first responders to take on whatever task was needed to restore calm in the wake of turmoil and chaos. They helped organize and distribute food, water and emergency supplies; cleared debris from destroyed homes; helped families locate their possessions. They erected tents for those who lost their homes, and removed metal, wood and other debris strewn across acres of farm land that made it impossible for local farmers to harvest their crops. And they helped those affected come to grips with the fury of the storms and the savage power they unleashed on their lives, by providing Scientology assists. These techniques were developed by Scientology Founder L. Ron Hubbard that help the individual recover more rapidly from the effects of trauma, injuries and illness. In creating the Volunteer Minister program in 1976, Scientology Founder L. Ron Hubbard provided simple, effective tools anyone can learn to help reverse the effects of trauma, loss and stress. And while Volunteer Ministers saw to the physical needs of victims and those working at their site, the unique brand of “spiritual first aid” they were trained to provide was even more valuable. Transcending all ethnic, cultural and religious boundaries, the Volunteer Minister program is there for anyone in need of help. Volunteer Minister training is available free of charge through the Scientology Volunteer Ministers website to anyone who wishes to help others.